This is Hairy Larry inviting you to enjoy Something Blue every Saturday night at ten. This week we’ll hear The Bennie Maupin Quartet and Miles Davis. Welcome to Something Blue, I’m Hairy Larry and I’ve got the blues, for you. All right now, that’s the Bennie Maupin Quartet playing “ATMA”. Before that we heard “Escondido”. The Bennie Maupin songs I am playing for you tonight are from his 2008 release, “Early Reflections”. Benny Maupin played bass clarinet and other reeds with Miles Davis and Herbie Hancock. He is a jazz fusion innovator. I’m Hairy Larry, host of Something Blue. Visit the Something Blue website at http://sbblues.com. Find out more about Bennie Maupin at http://benniemaupinmusic.com. And more about Miles at http://milesdavis.com. Now that’s what I’m talking about. It’s The Bennie Maupin Quartet doing “The Jewel In The Lotus”. What an extraordinary sound. I’m Hairy Larry, host of Something Blue. 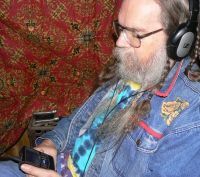 Friend me or message me on Facebook or on the Delta Boogie Network at http://deltaboogie.net. Bennie Maupin is playing on this next Miles Davis song. From “A Tribute To Jack Johnson”, recorded in 1970, here’s “Yesternow”. And now here’s a MixCloud bonus. Three songs from “Collaborators” an album that I made with Richard Murray. Here’s “Miracles”, “Promises”, and “Spam”. This entry was posted in Shows and tagged Bennie Maupin Quartet, Blues, Hairy Larry, Jazz, Miles Davis, Richard Murray. Bookmark the permalink.